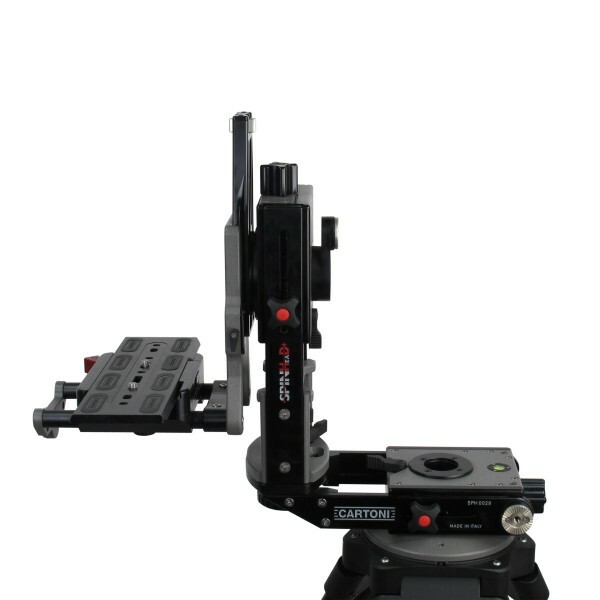 Product information "Cartoni Spinhead / Cine Style Slide"
The new CARTONI Spinhead is an innovative and unique support head for any film or video camera weighing up to 18 kg (40 lbs). Its ‚"L" shape configuration allows to operate at nodal setting (coincidence of the rotation center with the optical center) on a tripod, dolly, on camera cars, underslung from a crane or a jib arm. Both pan and tilt movements are assisted by CARTONI patented continuous fluid drag units. These fluid drag modules are hollow in the center in order to allow cables and plugs. The unique feature is a spinning tilt unit which offsets the camera allowing to pivot the camera plate for 360 degrees and lock it at any angle you may desire. All settings are easily accessible and comfortable to operate, the camera can be centered on board with micrometric cranks. The camera attachment is achieved by a quick release long dovetail plate or alternatively with a cinestyle european quick release camera plate. Related links to "Cartoni Spinhead / Cine Style Slide"
Customer evaluation for "Cartoni Spinhead / Cine Style Slide"